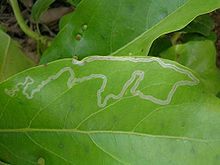 A leaf miner is the larva of an insect that lives in and eats the leaf tissue of plants. The vast majority of leaf-mining insects are moths (Lepidoptera), sawflies (Symphyta, close relatives of wasps) and flies (Diptera), though some beetles also exhibit this behavior. Like woodboring beetles, leaf miners are protected from many predators and plant defenses by feeding within the tissues of the leaves, selectively eating only the layers that have the least amount of cellulose. 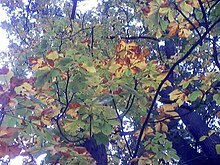 When attacking Quercus robur (English oak), they also selectively feed on tissues containing lower levels of tannin, a deterrent chemical produced in great abundance by the tree. The pattern of the feeding tunnel and the layer of the leaf being mined is often diagnostic of the insect responsible, sometimes even to species level. The mine often contains frass, or droppings, and the pattern of frass deposition, mine shape, and host plant identity are useful to determine the species and instar of the leaf miner. A few mining insects feed in other parts of a plant, such as the surface of a fruit. Leaf miners are regarded as pests by many farmers and gardeners as they can cause damage to agricultural crops and garden plants, and can be difficult to control with insecticide sprays as they are protected inside the plant's leaves. Spraying the infected plants with spinosad, an organic insecticide, can control some leaf miners. Spinosad does not kill on contact and must be ingested by the leaf miner. Two or three applications may be required in a season. Make note that it will have harmful ecological effects, especially if sprayed when bees or other beneficial insects are present. Leaf miner infection can be reduced or prevented by planting trap crops near the plants to be protected. For example, lambsquarter and columbine will distract leaf miners, drawing them to those plants and therefore reducing the incidence of attack on nearby crops. This is a method of companion planting. ^ Walker, Matt (19 June 2009). "The plant that pretends to be ill". BBC News. Retrieved 13 April 2016. ^ Soltau, U.; Dötterl, S.; Liede-Schumann, S. (2009). "Leaf variegation in Caladium steudneriifolium (Araceae) – A case of mimicry?" (PDF). Evolutionary Ecology. 23 (4): 503–512. doi:10.1007/s10682-008-9248-2. Retrieved 12 April 2016. Wikimedia Commons has media related to Leaf mining. British leafminers - many of which are distributed widely across Europe. The leaf and stem mines of British flies and other insects. Includes illustrated keys for identification of mines by host plant genus and detailed descriptions of over 900 species along with their distribution in Great Britain and Northern Ireland and elsewhere. Leafminers of Europe - covers over 1800 leafmining insect species.